THIS WEEKEND! Saturday, Feb. 24 at 5:00 p.m. and Sunday, Feb. 25 at 2:00 p.m. in Kenyon Arena. 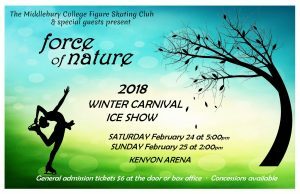 The Ice Show features skaters of all ages and abilities, including lots of local kids, in a fun event filled with music and costumes. Cheer on the beginners and be dazzled by competitive skaters, including local guest stars and a pair who competed internationally for Team USA. Sunday’s show will include the Catamount Blades, UVM’s competitive synchronized skating team. Come and enjoy the show! Tickets are $6.00 (general admission), available at the door or in advance at the College box office. Concessions will be available. Kenyon Arena is fully accessible. The Winter Carnival 2018 Ice Skating Show is run by the Middlebury College Figure Skating Club, a non-competitive figure skating program. Participation is open to kids from the entire local community.